There is a new folder full of installers located at C:\ProgramData\Package Cache\. I believe this is from Visual Studio 2012 RC. Can I delete these gigabytes of data without consequences? Are they all temporary files? It's a beta product so I'm not sure there is much information out there about this folder. There have been conflicting reports about whether the absence of this folder (as a consequence of deleting it) will actually and in all cases cause issues with the visual studio installation, i.e. during normal operation, during reinstall, patch/upgrade, repair install, or uninstall. However, the recommendation from MICROSOFT is clearly to NOT DELETE IT. When repairing, modifying, or uninstalling a product or when installing or uninstalling a patch, if source media is required the package cache is used automatically and most users will never see a prompt. 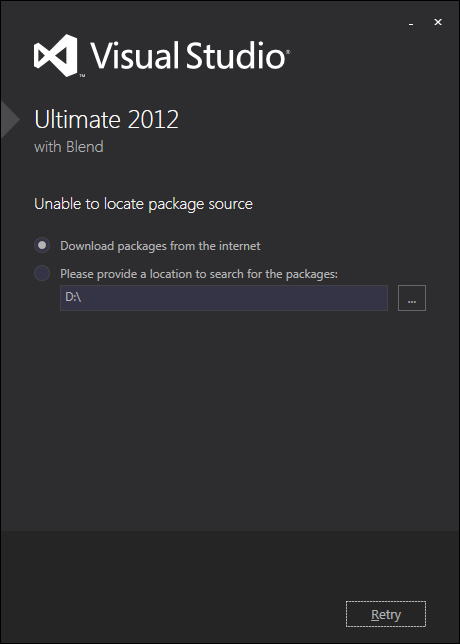 Only if the package cache is missing or incomplete will Visual Studio setup prompt to download (if connected) or locate media as shown in the screenshot below. Even though we will prompt to download packages to the cache if missing, we recommend users do not remove the package cache. Not only is the cached used by many other products that are installed with Burn and may not provide the same download experience, there are scenarios when Windows Installer may require source that we cannot handle because our code is not running. Whenever you are prompted for the media/receive any errors about missing files/missing location, you simply make sure to remount/reinsert your drive/media if it's not already a live partition. Once moved, in order to "link" the old mount point/location (in most cases C:\ProgramData\Package Cache\), you simply create a directory junction to it. Junctions are recognized at the file systemlevel as an alias entry in the FSTAB. Therefore, it's transparent to all programs, including the OS itself. In other words, it is NOT seen as a file that simply points to another location (like a shortcut) and therefore always works without incident. NOTE: If you make the newpath absolute, you'll be able to move link without breaking the pointer to the newpath. If you make the newpath relative, you'll be able prevent breaking the link, as long as you move BOTH the link and target TOGETHER and maintain their relative paths. LSE allows you to create symlinks, hardlinks, junctions, smartcopies, smartclones, smart mirrors, smart moves, splices, multiple sources, and bunch of other stuff I found too confusing to read, frankly. But, it's a brilliant free product that creates a Windows Explorer context menu that allows you right-click on your LINK-TARGET folder then drag it to where you'd like to create the actual link. You can of course rename the link to anything you'd like. I've found the same folder on my laptop after installing VS2012. I tried renaming that folder to '__Package Cache'. When I then tried to uninstall VS2012 the uninstall process failed to start. You can leave the files there. Everything will work but it will use lots of disk space. You can delete the files, and if you want to uninstall VS 2012, you can re-run the original installer to put the files back, then uninstall. Junctions and symbolic links are the only answer for moving system files to another drive. They are NTFS filesystem-level features that even Windows itself is oblivious to, and thus are a really big hammer (and potential security risk) that should be used sparingly unlike their UNIX/Linux/BSD counterparts, since they have been around a lot longer on that OS family and UNIX/Linux/BSD programs know how to deal with them. All the software's installers are saved in this folder. It would fail when you try to uninstall a software after deleting this folder. I noticed this folder after I installed Visual Studio 2012, in my case everything in it contained to the Visual Studio 2012 installation, I manually removed it and everything seems to be working including Visual Studio. No. If you delete this folder, you won’t be able to uninstall (and possibly update) Visual Studio. YES you can delete this directory, if you have uninstalled Visual Studio. I found this directory after uninstalling Visual Studio in preparation for installing a SSD smaller than the hard drive I was using before. This computer is no longer a development station. Uninstalling Visual Studio left behind some other software like a program to connect to a local SQL server, which I do not have. I uninstalled it. It also left behind several .NET programs but I don't know which ones are safe to uninstall so I left them in place. So to the point of the question: I did delete this directory. It was quite large so helped me to fit into my SSD better. Now a day later I haven't noticed any problems. I gained about 2 GB of disk space on my system drive from that (YMMV). It's usually better not to mess up with deleting these files manually, and instead leave this task to either Windows Disk Cleanup, or other disk cleaning tools. The one I personally use and can recommend you is the CCleaner. CCleaner can help you automatically find obsolete files in a program and deletes them for you. Not the answer you're looking for? Browse other questions tagged windows disk-space or ask your own question. Is it normal to have 16 gigabytes of DLL files? Delete Package Cache after uninstalling Visual Studio 2013 Express? Can I (re)move Microsoft Help files? How do I purge registry for a program? Is there a way to determine the Superfetch cache hit rate? Is it OK to delete Visual Studio Community 2015 \OfflineCache\installers\ content? How to clear Chocolatey cache in the free version?